No such thing as an easy garden? Little time? A family in Pasadena, California is making a living from selling produce grown in their yard to neighbors and restaurants. They grow 6,000 pounds of produce on 1/10th of an acre of cultivated land per year. While organic food accounts for only 1%- 2% of all food sales worldwide, the organic market expands up to 20% per year. We believe that the organic market is small right now because of lack of education about health dangers of GE (genetically engineered) food and the lack of labeling of GE food. Most Americans don't realize that about 75% of their diet is GE. As Americans awaken, the demand for pure non-GE foods is increasing. Organic farming is not only healthier but yields can increase, pollution decreases and water use can be decreased. 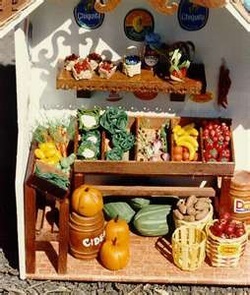 Some Americans barter or sell produce grown in their yards to neighbors, farmer's markets, church communities, etc. You can earn extra money selling produce grown in your yard. Because there is a wealth of information on the Internet about how to grow produce in your yard, we will explore some other innovative ideas and suggestions for creating markets. There will always be a market for food. Food shortages are in large part due to human collectivist control. Therefore, the more self-reliant people become, the more free they are from control. If the government had an interest in price stabilization, they would increase strategic grain reserves to be used in emergencies. However, our government is more interested in controlling the masses. In 2008, the feds sold off all but 2.7 million bushels of wheat and food reserves remain low to this day. America is resource rich. It is absurd that there should be food shortages, but human greed and lust for power have put the American food supply in a precarious position. GENETICALLY ENGINEERED VS. NATURAL FARMING People want to eat healthy foods and are waking up to the fact that most food in America is tainted. GE crops can contaminate other plants. GE farming increases pesticide and herbicide use dramatically, which pollutes water sources.